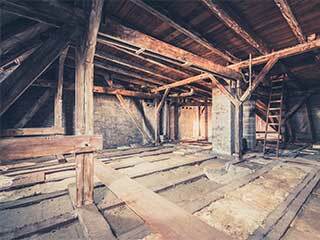 Why Have Your Attic Cleaned? Even if you haven’t had any issues with pests invading the attic, the dust accumulation alone is enough of a reason to get it cleared out. The dust isn’t just messy and annoying if you go up to bring some of your belongings down, it can easily enter the air you and your family breathe. This can cause anything from irritated allergies, to breathing troubles for the elderly and those affected by asthma. If rodents are living in your attic, it’s even more imperative. The waste left by these unwanted guests can carry all kinds of bacteria and viruses, which can then enter your household and infect you or your family. Even worse, if some of them have died, the rotting can draw in even more troubles, such as bugs. You may be bringing down all sorts of nasty, tainted materials when you retrieve something from the attic, depending on what’s been hiding in those boxes. After having your attic perfectly cleaned and insulated, you can turn it into a warm and inviting bedroom or reading room. With a clean attic, all you need is some new furniture, beautiful motorized shades, and you’re good to go! Our professionals are ready to help you get your attic like new again, and get rid of any potential health risks in the process. They can safely clean out all the dust, droppings, and any other contaminates from your attic. They’re able to do this carefully, making sure that none of it enters your home. This is important, as otherwise the bacteria can be spread more heavily. After that’s done, they can use a sterilization spray to get rid of any lingering hazards, and make sure that your attic and home are safe. We can also handle any insulation that may have been damaged by the rodents, so you won’t have to fuss with finding another company to take care of that! Our experts can handle it all. Don’t Risk Your Family’s Health. It’s far better to be safe than sorry! Contact Attic Cleaning Los Angeles now to find out how we can get your attic spotless, and ensure that your home is safe.